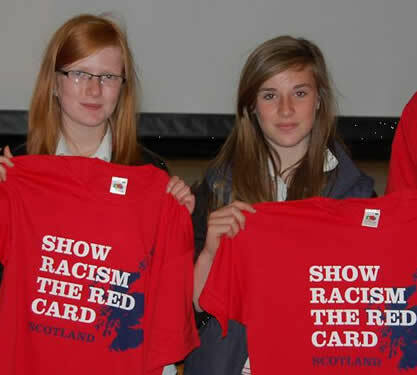 Show Racism the Red Card successfully delivered educational workshops in all six of East Lothian secondary schools with all S1 pupils as part of a programme for National School Sports Week 6th – 10th June. Pictured are lucky pupils from North Berwick High School with their Red Card T-shirts which they were awarded for excellent input during the workshop delivery. "I have had a very enthusiastic teacher on the phone to say how much he valued the input you made in the school. It is fantastic to get this kind of feedback and we are delighted to get it!" The schools in East Lothian were very keen to engage with the campaign and the 1,100 young people we worked with were very positive about it.